According to many accounts, chile peppers were introduced into what is now the U.S. by Capitn General Juan de Oñate, the founder of Santa Fe, in 1598. However, they may have been introduced to the Pueblo Indians of New Mexico by the Antonio Espejo expedition of 1582-83. According to one of the members of the expedition, Baltasar Obregón, “They have no chile, but the natives were given some seed to plant.” By 1601, chiles were not on the list of Indian crops, according to colonist Francisco de Valverde, who also complained that mice were a pest who ate chile pods off the plants in the field. “A la primera cocinera se le va un chile entero,” goes one old Spanish dicho, or saying: “To the best lady cook goes the whole chile.” And so it is that the chile pepper is the single most important food brought from Mexico that defines New Mexican cuisine. After the Spanish began settlement, the cultivation of chile peppers exploded, and soon they were grown all over New Mexico. It is likely that many different varieties were cultivated, including early forms of jalapeños, serranos, anchos, and pasillas. 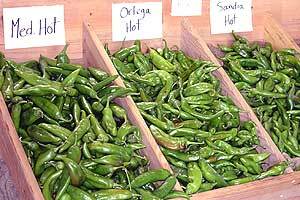 But one variety that adapted particularly well to New Mexico was a long green chile that turned red in the fall. Formerly called “Anaheim” because of its transfer to the more settled California around 1900, the New Mexican chiles were cultivated for hundreds of years in the region with such dedication that several distinct varieties developed. These varieties, or “land races,” called ‘Chimayo’ and ‘Española,’ had adapted to particular environments and are still planted today in the same fields they were grown in centuries ago; they constitute a small but distinct part of the tons of pods produced each year in New Mexico. New Mexican chiles are pod types of the annuum species. The plant has mostly a compact habit with an intermediate number of stems, and grows between 20 and 30 inches high. The leaves are ovate, medium green, fairly smooth, and about 3 inches long and 2 inches wide. The flower corollas are white with no spots. The pods are pendant, elongate, bluntly pointed, and measure between 2 and 12 inches. They are dark green, maturing to various shades of red. Some ornamentals are yellow or brown. Their heat ranges from quite mild to medium, between 500 and 2,500 Scoville Units. 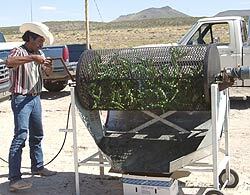 New Mexican Chile varieties offer various heat levels. Varieties of the New Mexican pod type are: ‘Anaheim M’ (mild, 8-inch pods); ‘Anaheim TMR 23’ (mild, 8-inch pods that are mosaic-resistant); ‘Chimayó’ (a land race from northern New Mexico with thin-walled, 6-inch pods); ‘Española Improved’ (pods 5 to 6 inches, medium heat); ‘Fresno’ (erect, 2-inch pods, medium-hot); ‘New Mexico No. 6-4’ (the most commonly grown New Mexican variety, pods are 7 inches long with medium heat); ‘NuMex Big Jim’ (long pods, up to 12 inches, medium heat); ‘NuMex Eclipse'(chocolate-brown, mild, 5-inch pods); ‘NuMex Joe E. Parker’ (improved 6-4 variety); ‘NuMex Sunrise'(bright yellow, mild, 5-inch pods); ‘NuMex Sunset’ (orange, mild, 5-inch pods); ‘NuMex R Naky” (pods are 5 to 7 inches long with mild heat); and ‘Sandia” (medium hot, 6-inch pods with thin walls). The earliest cultivated chiles in New Mexico were smaller than those of today; indeed, they were (and still are, in some cases) considered a spice. But as the land races developed and the size of the pods increased, the food value of chiles became evident. There was just one problem–the bewildering sizes and shapes of the chile peppers made it very difficult for farmers to determine which variety of chile they were growing from year to year. And, there was no way to tell how large the pods might be, or how hot. The demand for chiles was increasing as the population of the state did, so it was time for modern horticulture to take over. In 1907, Fabian Garcia, a horticulturist at the Agricultural Experiment Station at the College of Agriculture and Mechanical Arts (now New Mexico State University), began his first experiments in breeding more standardized chile varieties, and, in 1908, published “Chile Culture,” the first chile bulletin from the Agricultural Experiment Station. In 1913, Garcia became director of the Experiment Station and expanded his breeding program. Finally, in 1917, after ten years of experiments with various strains of pasilla chiles, Garcia released New Mexico No. 9, the first attempt to grow chiles with a dependable pod size and heat level. The No. 9 variety became the chile standard in New Mexico until 1950, when Roy Harper, another horticulturist, released New Mexico No. 6, a variety which matured earlier, produced higher yields, was wilt resistant, and was less pungent than No. 9. In 1957, the New Mexico No. 6 variety was modified, made less pungent again, and the new variety was called “New Mexico No. 6-4.” The No. 6-4 variety became the chile industry standard in New Mexico and over thirty years later was still the most popular chile commercially grown in the state. Other chile varieties, such as Big Jim (popular with home gardeners; see picture above) and New Mexico R-Naky, have been developed but became popular mostly with home gardeners. Today, Dr. Paul Bosland, who took over the chile breeding program from Dr. Nakayama, is developing new varieties that are resistant to chile wilt, a fungal disease which can devastate fields. He has also created varieties to produce brown, orange, and yellow ristras for the home decoration market. The breeding and development of new chile varieties–in addition to research into wild species, post-harvest packaging, and genetics–is an on-going, major project at New Mexico State. But modern horticultural techniques finally produced fairly standardized chiles. New Mexico is by far the largest commercial producer of chile peppers in the United States, with about 35,000 acres under cultivation. All of the primary dishes in New Mexico cuisine contain chile peppers: sauces, stews, carne adovada, enchiladas, posole, tamales, huevos rancheros, and many combination vegetable dishes. The intense use of chiles as a food rather than just as a spice or condiment is what differentiates New Mexican cuisine from that of Texas or Arizona. In neighboring states, chile powders are used as a seasoning for beef or chicken broth-based “chili gravies,” which are thickened with flour or cornstarch before they are added to, say, enchiladas. In New Mexico, the sauces are made from pure chiles and are thickened by reducing the crushed or pureed pods. New Mexico chile sauces are cooked and pureed, while salsas utilize fresh ingredients and are uncooked. Debates rage over whether tomatoes are used in cooked sauces such as red chile sauce for enchiladas. Despite the recipes in numerous cookbooks, traditional cooked red sauces do not contain tomatoes, though uncooked salsas do. 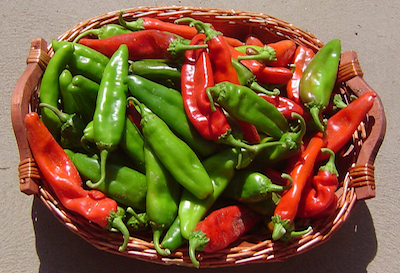 New Mexicans love chile peppers so much that they have become the de facto state symbol. Houses are adorned with strings of dried red chiles, called ristras. Images of the pods are emblazoned on signs, T-shirts, coffee mugs, posters, windsocks, and even underwear. In the late summer and early fall, the aroma of roasting chiles fills the air all over the state and produces a state of bliss for chileheads.